We are thrilled to continue offer this weekly Adaptive Dance class for children and youth with Down Syndrome, Autism Spectrum Disorder and other specific needs! This class will provide the opportunity for continued study for participants of our Inclusive Dance Outreach program as well as provide quality dance instruction for those new to our program or new to dance altogether. Payment plans, scholarships and tuition assistance are awarded based on need and dependent on funding available. If you are in need of assistance or wish to request and alternative tuition payment plan, please include a letter detailing your situation along with your completed registration packet. Our Inclusive Dance Outreach Program provides dance training for children with Down syndrome, Autism Spectrum Disorder and other specific needs as a means of celebrating all levels of ability. Our Inclusive program is designed to include a series of 40-50 minute sessions exploring classical ballet fundamentals, jazz and contemporary dance, freestyle movement and guided improvisation. Participants also explore the creative process of choreography and are invited to perform with our professional contemporary dance company in a special piece in our performances at the Lyric Theatre. This program is designed to accommodate a small group of 5-15 students. For best results we suggest booking a minimum of eight sessions for your group. This program can accommodate up to 30 students per session. 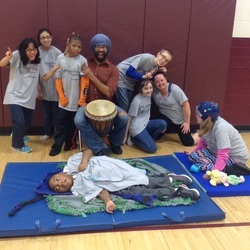 *Free Inclusive Dance Outreach programming is available for title I schools through grant funding! Please contact us for details and availability! Lecture Demonstrations are priced at $200 and can accommodate larger groups of up to 100 students. If your school is in need of full or partial scholarships for any of the programs selected above, please submit a letter explaining your needs and include; your school's name, address and contact information, the program(s) you would like to find sponsorship for and the grade level or age and number of students who will be participating.